Ross Vasta, Joe Andon & Malcolm Turnbull. 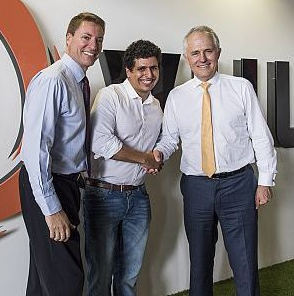 Vuly Trampolines CEO Joe Andon welcomed Minister Malcolm Turnbull and Federal Member for Bonner Ross Vasta to the company's Brisbane headquarters for a tour of the offices and research lab. The ministers viewed a video presentation on the company, Vuly Trampolines, which showcased its products in development; shook hands with staff; and praised the company for its Australian entrepreneurship. Turnbull was also presented with a die-cast, engraved Vuly logo. In just under 10 years, Vuly has grown into a worldwide leader in the backyard trampoline industry and earlier this year singed a distribution licensing agreement with Canada's Spin Master that covers the US, Canada, Mexico and European territories.